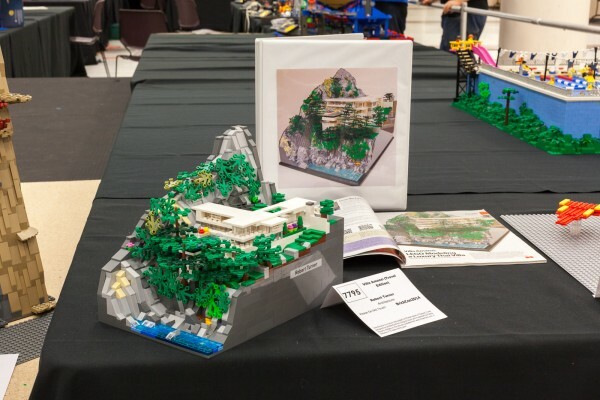 This year was my first time participating in the private BrickCon convention for Adult LEGO fans, instead of crowding in with thousands of LEGO fans of all ages during the short Public Exhibition. Since this was my first year, I didn’t know exactly what to expect (as I mentioned in an earlier post). Not only was I attending for the first time, but I was also displaying some of my models to the public for the first time as well. My modest LEGO Architecture display. Public Exhibition – On Saturday or Sunday, you can pay about 10$ to simply walk through the models which are on display and the vendor booths. The models are really impressive, and I think it’s well worth the cost of admission. I should warn that the exhibition can be quite crowded, so I highly recommend arriving early or near the end of the day. It takes me about 1.5 hours to walk through and see all the models, since I don’t spend a lot of time at the vendor booths. 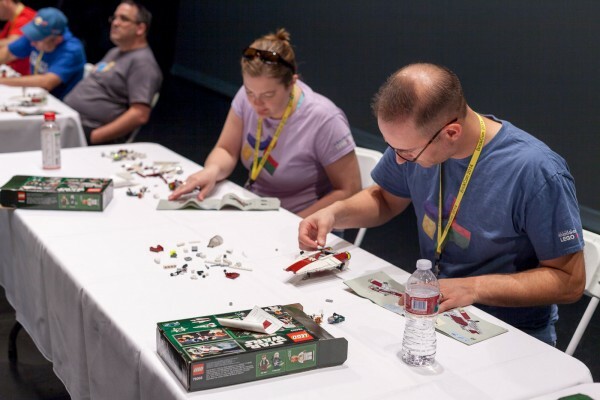 Private Convention – For a much higher admission (55$ or more) and a full 3-day time commitment, Adult LEGO enthusiasts can sign-up for the Private convention. This gives you access to the showroom outside of the Public exhibition hours, an opportunity to play LEGO-themed games and contests, a number of talks about LEGO building techniques and the broader LEGO community, and three evening presentations with a good chance of getting a LEGO raffle item gift. 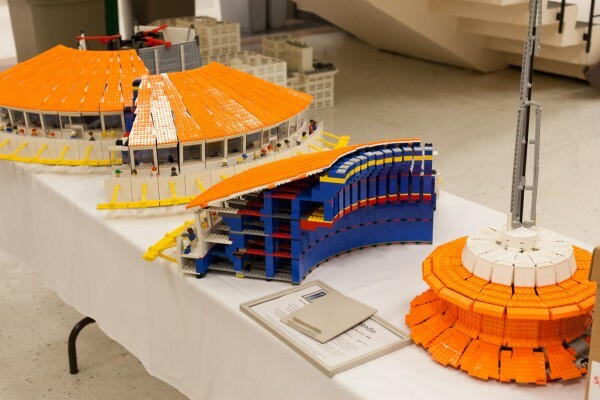 It is also a prerequisite to display your LEGO models at the Public Exhibition. 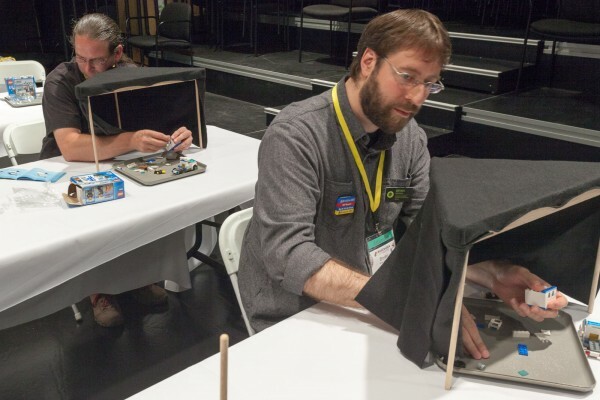 I’m glad that I had already attended around 5 meetings of the Seattle LEGO Users Group before attending the Private convention. I don’t know a ton of members by name yet, but at least there were a lot of familiar faces. The LEGO brick name tags which people wear during the convention are very helpful for this reason! 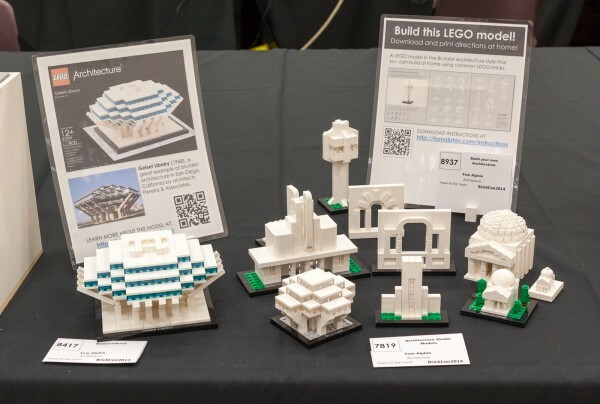 For me, the convention started on Thursday, since I took a long lunch break from work to drop off my LEGO Architecture models and pick up my registration packet. This is also when you sign-up for the various LEGO games and contests. I was pleased to receive a goodie bag while registering which included my badge and the convention calendar booklet. I received two LEGO Nametag bricks which I customized to show my name and my website URL, and a strong Magnet to hold it on my shirt. I also got two small LEGO sets and some custom Minifigure accessories from some of the sponsors. Not a bad start! I built a frame out of LEGO to protect the smaller models during transport. Imperial Star Destoryer – some assembly required. What I really enjoyed was watching the show come together. It is really neat to see only a few half-assembled models on Thursday morph into a packed show by Friday evening. It was really cool to see how people transport massive models like an 6 foot Imperial star destroyer (Star Wars), a massive Space Needle broken down into smaller modules, or Anu Pehrson’s “Tiger’s Nest Monastery” which breaks down into about 20 large cardboard boxes for transport. There’s a broad array of LEGO building games throughout the three-day show, although most of them were on Friday and Saturday. They decide who will play each game based on a raffle, but it’s still good to get your name on the list before it’s full. I signed up for a bunch of the games, not knowing exactly which ones I would be good at or enjoy most. One of the unexpected treats in playing these games is that you get to keep the LEGO sets you build! Normally, they give everyone a single medium-sized set, but this year we got to build two smaller sets in a row. Mistakes are penalized by some number of seconds per incorrect piece, so you really want to get it right. The first set was 30028 – Holiday Wreath, a 50-piece polybag from 2011. I had no difficulty building this very quickly, but there were a few folks in the room who beat me by at least 30 seconds. Wow. Other attendees finishing the box build challenge. For the second model, we built 31001 – Mini Skyflyer at just 62 pieces. It was a much more difficult model due to parts which you couldn’t see which form the center of the model, and the lack of an easily repeatable pattern as in the Wreath. In the end I finished respectably, a little before 1/2 way through the pack, but definitely not a leader by any stretch of the imagination. I learned that I am not nearly as good at building models outside of my normal Architecture focus. My second game was Blind build, where you need to build a model as fast as you can without seeing what you are building! They have wooden stands with black fabric so you can build the model without seeing it, while the audience can watch your progress from the other side. 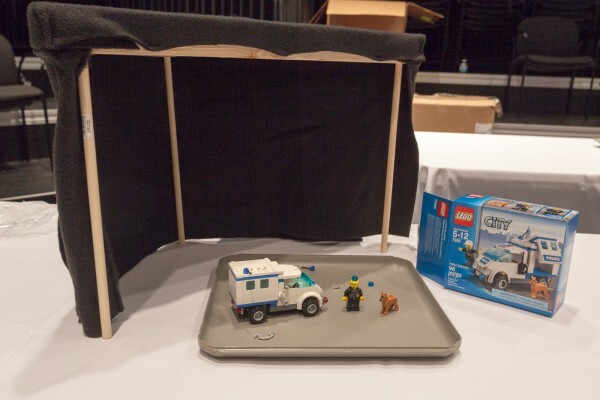 For this competition, we built 7285 – Police Dog Unit and we could use the instructions. This game is super challenging and stressful because the majority of time spent during the contest is the quest for the right piece. Trying to finish the model in “Blind Build” competition. After about 1/3 through the model, I realized that I would have an easier time finding the piece I need if I sorted them in some way. As such, I took a break from building the model to sort the bricks, in some case stacking related bricks so I could find them easier later. This proved to be a good maneuver, and I finished about 12th place out of 45 contestants. Not good enough to go on to the “Finals” round, but I still felt good about my effort. In my haste, I made a dumb mistake. That’s not a hat on the policeman’s head! The final game which I got to play was the One-handed build. 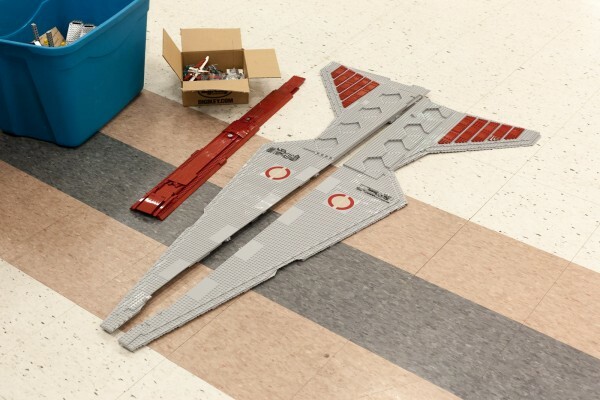 In this contest, you can only use one hand to assemble the model, in our case 177 piece 75003 – A-wing Starfighter Your other hand can only touch the instruction manual. To be clear, you are free to use the table, your feet, your mouth, whatever goes – but just one hand. In practice, I built most of the model with just the one hand, although I found that the minifigures were much easier to assemble by putting the torso in my mouth and using my hand to attach the head. I actually did a really good job on this contest, finishing around 5th overall. 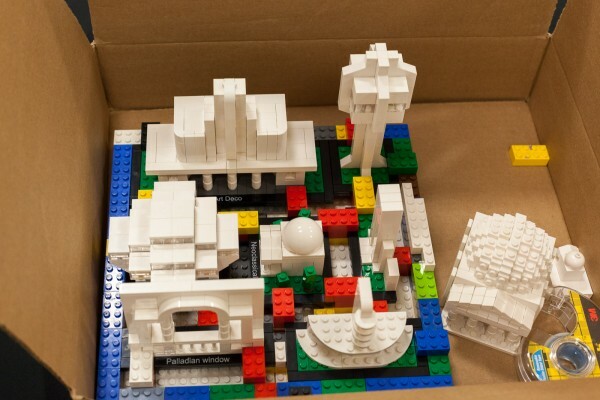 Not bad, especially since the winner was Ryan McNaught, a LEGO Certified Professional LEGO builder from Australia. The conference has three large gatherings in the evenings, a Keynote on Friday, the Awards Ceremony on Saturday, and a closing ceremony on Sunday. There are also numerous talks and other sessions throughout the weekend. Benny gets a Tattoo on his birthday? 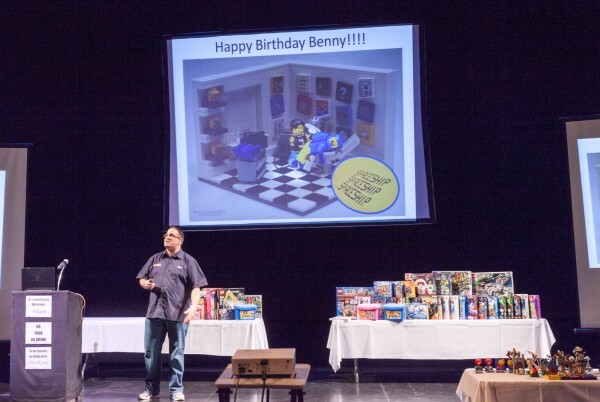 In the Keynote, Ryan McNaught shared photos and stories about his experiences as a LEGO Certified professional. He talked about what it’s like to build massive commissioned projects for LEGO and LEGO retailers. He also had lots of colorful and less kid appropriate stories. One of the funniest projects he organized was an online challenge to better understand what happened to Benny the spaceman on his 30th birthday bender, since he was introduced in the mid-eighties. The Awards ceremony was a chance for the organizers to thank everyone for their hard work, and to celebrate some of the best models at the show. I got an award for my Microscale Geisel Library which was an unexpected treat. All the other models which received awards, and many of the models which weren’t recognized are truly excellent. The award trophies were all built out of LEGO bricks which is an awesome detail to see… The closing ceremony was lower-key, especially since it is after a long weekend and many of the LEGO builders had several hours of work ahead to disassemble their models and take them home. 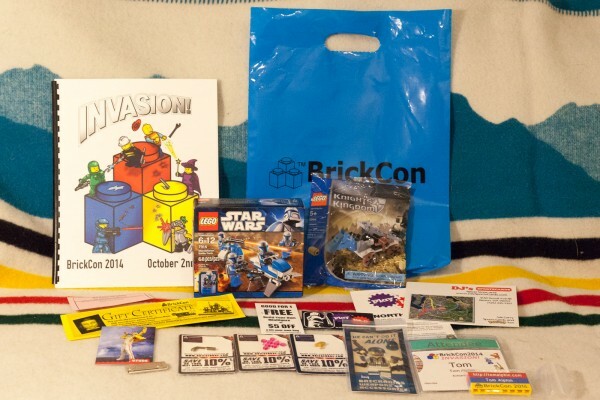 It was one last chance to giveaway some free LEGO prizes which everyone seemed to enjoy. 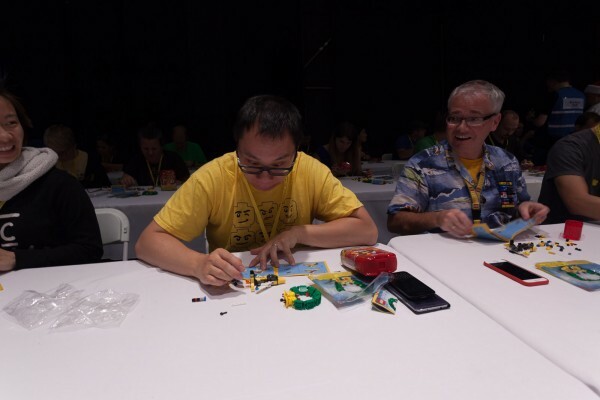 I also attended talks on the BrickLink website, advanced LEGO building techniques and a roundtable discussion on techniques for keeping your LEGO organized. (I showed people my Printable LEGO Labels which some people had seen and others were interested in trying at home.) These sessions were interesting for me and for the people attending, but are definitely reserved for serious LEGO geeks. Bricks are sorted by type before the draft begins. Lastly, I also participated in a LEGO set draft for the first time. In a draft, a whole bunch of people bring exactly the same LEGO set, and the parts from many copies of the set are sorted by type. Then, each person draws a number from a hat, and in that order you take all the parts of the type you want most until all the bricks are gone. 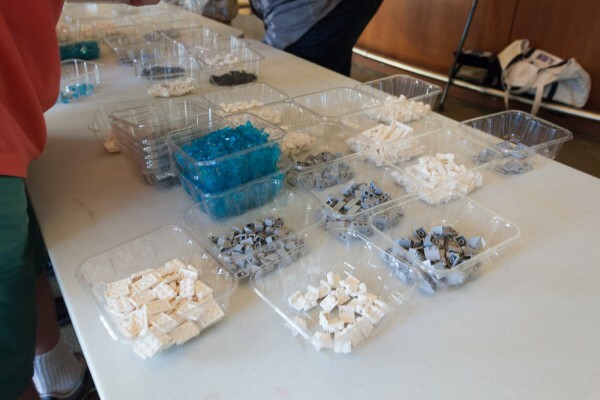 I was more excited than ususal to participate, since the set was 21020 – Trevi Fountain which is packed with White and trans-light blue LEGO parts which I use in my own models. I prepared for the draft by doing a little research into the parts I needed most from the set. I selected those lots which were both very useful to me, and somewhat expensive to purchase on the secondary market, and ended up with lots of good bricks, including a ton of the super-common but useful white 1×1 brick. What about the Public Exhibition? The public exhibition looked fantastic – I’ve captured a lot of photos in on Flickr, and you can find even more photos in the public . I already featured some of my favorite models, and will close with a few more of my favorites. Robert Turner made a “travel edition of his amazing Villa Amanzi model which he brought to the conference from Chicago. 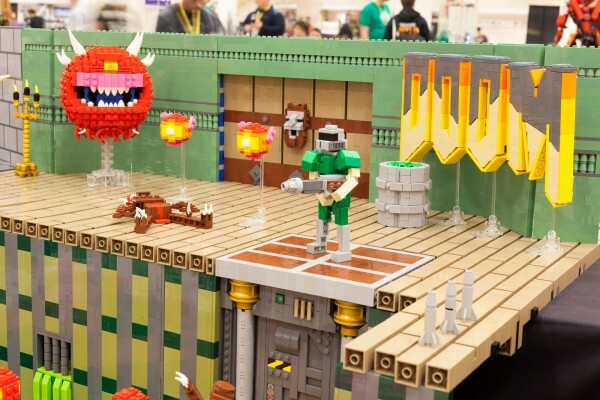 Unbelievable model of DOOM shows four different levels from this iconic Video Game. 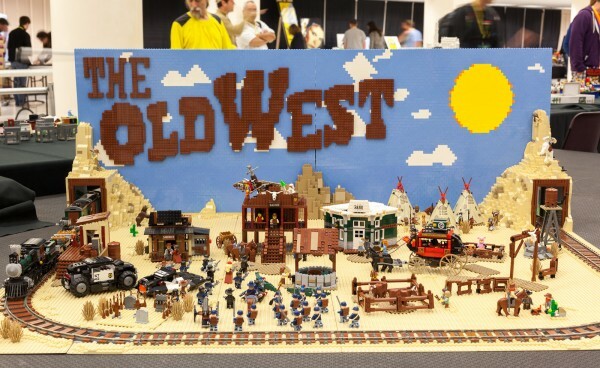 Old West model based on the LEGO Movie. 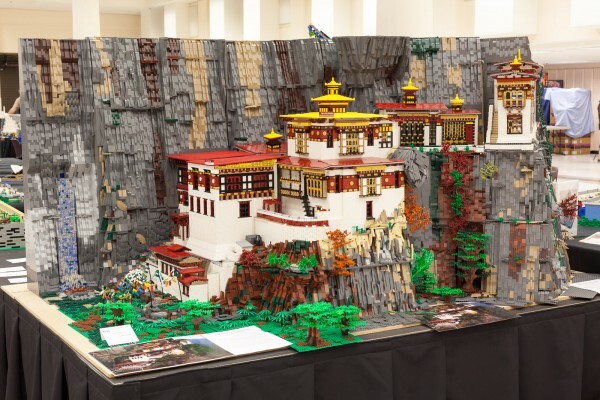 Tiger’s Nest Monastery by Anu Pehrson earned the “People’s Choice” award! I had a great time. 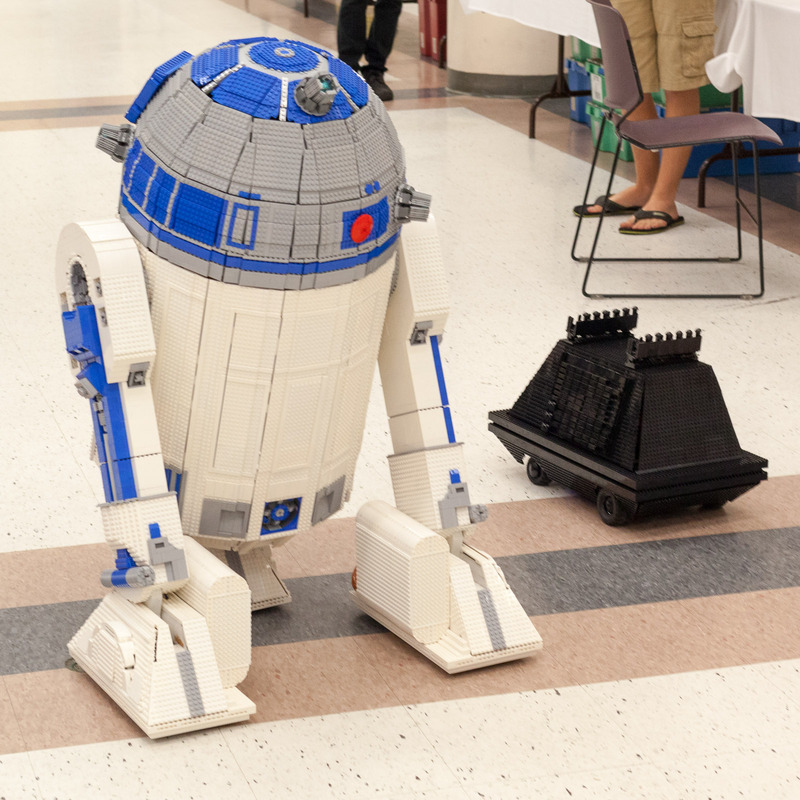 Needless to say, you need to be a serious LEGO enthusiast to make the most of the Private Convention. There is the fiscal cost which could be significant if you don’t live in the area, plus the time commitment. I definitely think that there is an opportunity for us to bridge the gap and offer something which in between these two options which is a better bridge for really enthusiastic kids and adults who aren’t sure if they want to get more involved or not. Some of the highlights for me were: Being able to see the models as they were reassembled. Being able to share my own models with the public and ask what they like most. Speaking with other LEGO builders especially Architecture builders like Robert, Anu, Alice and David. Opportunities for free LEGO. The LEGO games and challenges. I definitely look forward to attending again next year! Previous story Building a winning Microscale LEGO model! I think I saw there is a Brick Con coming next month to Charlotte. Didn’t know what to think of it, so I’m glad I stumbled across your review of the event. It sounds like we would have tons of fun inexpensively for the private convention, but of course would need extra money for lodging and a way to entertain the little one one she’s over all the bricks for the day. Makes me wish I had some personal models ready for showing!